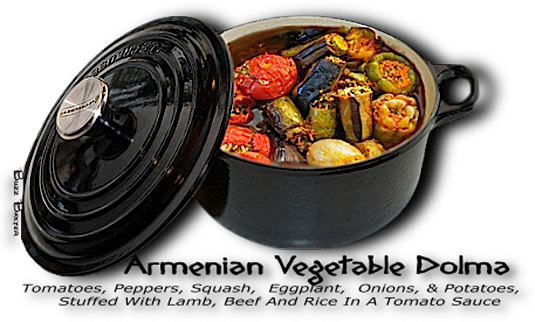 Armenian Dolma - A variety of vegetables stuffed with meat or rice or a combination of each. A variety of different vegetables filled with meat, rice or a combination of both. A vritual cornucopia of Armenian stuffed vegetables! leaves, quince and small eggplant. mixture,  put the cut top back on top and place upright in a large covered casserole. HOW TO ROLL UP VEGETABLE LEAVES. preheated 350º degree oven for about 1-1 1/2 hours. 5. Try this dish served with a dollop mahdzoon** (Greek style yogurt) over the filled vegetables. **See Soups or Yogurt for mahdzoon recipe or use plain yogurt.